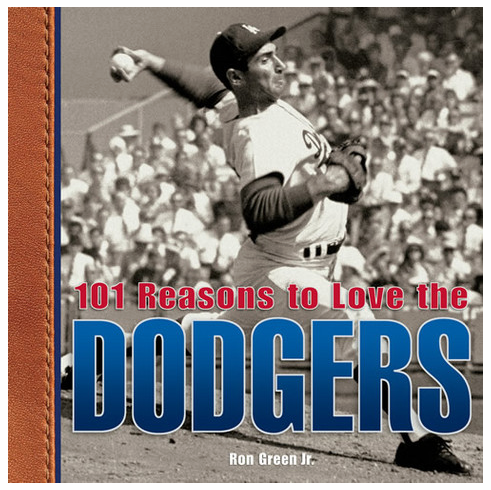 101 Reasons to Love the Dodgers by Ron Green, Jr.
Talk about a grand slam. With nearly 100,000 copies in print, the previous books in David and Ron Green�s �101 Reasons to Love� series have hit the ball right out of the park. Now Ron and Dave extend the home-run streak, bringing their offbeat humor, insiders� grasp of baseball fact and legend, and good-natured rivalry�as brothers and as fans�to new books about two of the National League�s all-time greatest teams. Pairing the Los Angeles Dodgers and the San Francisco Giants is a natural. After all, both clubs were born in New York City, and both moved to the West Coast in 1958. Both teams have lost the World Series exactly 12 times. And concessionaires at both teams� ballparks have made important contributions to that staple of baseball �cuisine��the hot dog. The glorious wins and the ignominious losses. The breathtaking hits, astounding catches, inexcusable errors. Whether you�re cheering the Dodgers or jeering the Giants�or vice versa�you gotta love �em. And, together, these books give you 202 reasons for doing so. Hardcover, 7" x 7", 120 pages.